Home >amazon Sellers >How to get reviews on amazon? There are several advantages of getting reviews to products on Amazon. As an Amazon seller, having lots of positive feedback from clients about your products offers you the intuition that can be applied to improve the process of creating your product/service and your client’s experience. Having a positive review of your product on Amazon also provide a yardstick for measuring the extent to which customers are satisfied. Keeping your clients happy is one of the most significant factors that should be placed into consideration as a seller on Amazon. Once you can keep them happy, you can always retain their loyalty. Positive reviews will provide you with trusted and reliable information. It can be used to make informed decisions to move your brand forward. You need to keep in mind that a positive review is very crucial to the success of your business on Amazon. On October 3rd, 2016, Amazon dropped a bomb on Amazon’s seller world and prohibited to send coupon codes and discounts in exchange for reviews. In the last few days and week, you can see that even reviews you got before the new update have deleted. Basically, what Amazon doing is cleaning its website from reviews with the disclaimer “I got the product with a discount in exchange for my honest review”. Moreover, until the October 3rd, you could see a lot of reviews that said “GREAT PRODUCT” and that’s it. Also, those reviews are gone already. No one knows what will be the end of it, but one thing is sure that sellers need to be very careful now. After Amazon already banned many sellers who manipulate its review system, including paying “under the table” to the reviewer – we will talk about it also in this guide. So, how can sellers get Amazon reviews after the new update? Here is what to do and what NOT to do. What should you do in order to get Amazon reviews? Now you probably say “but this is why we want reviews, to sell more”. So, let me explain myself. You can use sponsored products on Amazon, you can create promotions on our site, you can make a lightning deal or giveaway on Amazon. There are SO MANY WAYS to sell more, so just do it. The reviews will come with a good follow up job. Use our follow up tool in order to increase your seller feedback and reviews. The follow-up booster will send an automatic email to all of your Amazon customers. Everyone who bought your product on Amazon will get an email with a personal note, to ask for their opinion on your product. Do not ask them to leave a positive review/feedback or 5 stars product review, or any other exploitation on the buyer to leave a good review. Amazon can read the emails, and you don’t want to get suspended or banned from Amazon because of that. In the follow-up section, you have a great guide on how to create a perfect single follow up email that you can use and send to your Amazon Customers. Amazon has changed their policy regarding contacting Amazon shoppers after purchase. Now, you are allowed to send only ONE review request, and, you are not allowed to ask the shopper to change his reviews in any way through Amazon’s buyer-seller messaging system. Buyer can leave 5 unverified reviews on Amazon. If you sell in other places: Shopify, eBay, AliExpress, E-commerce or even offline store, ask them to leave their opinion on Amazon. It’s standing with Amazon TOS and this is exactly why the unverified reviews created for. 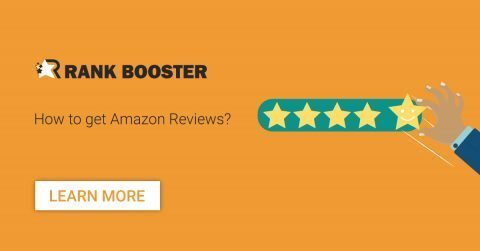 Those reviews don’t have any effect on your BSR (Best Seller Rank), but it will help you, as a beginner on Amazon, to create more sales with your sponsored products on Amazon, and to be honest, most of the customers on Amazon have no idea what is a VP review. Note, business card, or even on the product box, write your contact details and the request to leave their opinion about the product on Amazon, not in big, even at the bottom of the box, it’s working. Want to hear the 1,000,000$ idea how to increase dramatically your review rate with those customers? Add a QR code with the link to your reviews of your product. You can create one in 2 minutes and print it on your business card, insert, or on the box together with your contact details. Create one here. Since June 1st, 2017, Amazon published their program to gain more reviews. It is a paid service, yearly paid, with no way to cancel it. You must have last than 5 Reviews on your listing, and you must be a registered brand on Amazon in order to participate in the program. You can read more about the program on seller central (US). Click HERE to check it on Amazon. What not to do in order to get product reviews on Amazon? 1. DO NOT send the product with a discount in exchange to review on Amazon – It’s very clear, Amazon doesn’t allow doing that. Amazon knows who bought the product with a discount, and knows if he/she left the review after that. Do not be mistaken – an unverified review isn’t reviewing in exchange to discount. The review you got in exchange for a discount will be deleted and Amazon will penalize you for it. So there are no benefits to getting those reviews anymore, it will only impair you. Right to 03/16/2018, Amazon doesn’t allow to write unverified product reviews for new arrival products. Means codes and deep discounts will not help for new items. 2. DO NOT ask buyers to buy the product, and get a refund by PayPal or any other payment method. The major question after we said that to our clients is “how can Amazon know if I send money to my customer”. Amazon knows. Don’t forget that we are talking about one of the biggest companies in the world. Moreover, before the new update, the VP (Verified Purchase) reviews, was about 0.5% of the sales amount. After the new TOS, every new seller has 100% VP reviews. Do not be mistaken – Amazon will delete those reviews and moreover, it can lock your store. The violation is not only regarding the reviews in exchange to discount, it’s much more than that, it’s regarding that you are buying products from yourself, and manipulating Amazon’s systems. Amazon declares a war against PayPal refunds in exchange for Amazon reviews. Hundreds of Facebook groups have been deleted from Facebook, thousands of shoppers and sellers have been banned from Amazon. 3. DO NOT ask for positive reviews in any way. Even if it’s not in exchange for a discount. The common way today is to send automatic email, asking for reviews. Amazon is scanning those emails and if there is a manipulation of the customer intellect: Amazon will know and might punish your store. A seller offers a third party a financial reward, discount, free products, or other compensation in exchange for a review on their product or their competitor’s product. This includes using services that sell customer reviews, websites, or social media groups. In summary, there are many legit ways to get reviews on Amazon. Do it carefully and slowly, you are building a business for the long term and not for product reviews, good luck!